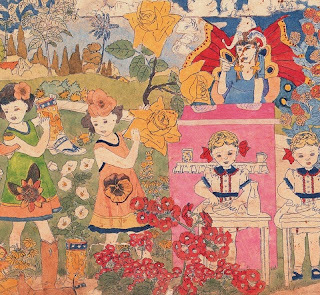 I first heard of Henry Darger whilst studying the work of Paula Rego who cites him as one of her influences. Then I saw his work at the Secret Service exhibition at the Whitworth Gallery. I like the colours and composition. He was a recluse and an outsider artist. His work has a lot of narrative and is definitely a bit weird ( thats putting it mildly). Some would say disturbing. However, all that interests me and I would like to find out more about the content of the images and what's driving it. There is also a film called "The Realms of the Unreal".